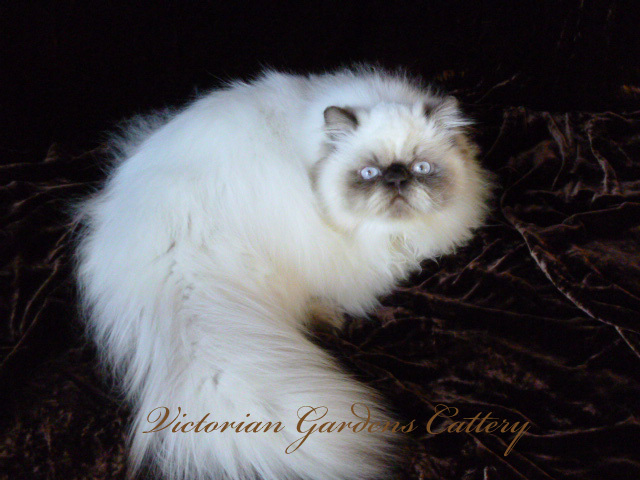 Welcome to Diamond's Nursery at Victorian Gardens Cattery. In Diamond's Nursery, we feature her new Persian litter, including their photos, videos, parents, and pedigrees. You will find all the latest news about her babies and their growth on "Our Cattery Blog". We usually are blogging several times a week during our kitten season. On June 13, 2015, Schann Westbrook and her daughter Summer, came to the Cattery to enjoy the day playing with the four litters (Pansy, Hydrangea, Holly and Diamond's babies). We had a great afternoon together. Schann has provided us wonderful memories of the day. Enjoy her special photographs from that day of Diamond and Miracle's litter. You can catch the full photo shoot of four litters at The Feline Photography of Purry Paw Prints. Diamond's babies are doing great under Hydrangea's careful and loving care. She treats them just like her own. She would not think for a minute they were not hers. She is a protective mother. Diamond's babies are the black babies in the candid photos. Today I made the decision to remove Diamond's babies from her and give them to Hydrangea since she was not caring for them or for herself. Hydrangea went right off to cleaning them up for me. I brought Pansy over to help. She immediately sat down and started helping nurse Hydrangea's babies. These two mothers have been lifesavers for me. And to think that Hydrangea is a first time mom. I think she will beat all my other mothers as the best mom. She is amazing. I had just fed Diamond's babies so they are sleeping. I have a dehumidifier running in the room to keep it dry and warm. It is a relief really to have Diamond's babies finally getting the care they need. Diamond didn't love on them and clean them at all. I was hand feeding them round the clock. I am feeling less stress knowing that that they are in loving and capable paws. Hopefully in a week, I can start weaning Holly's babies. Believe it or not, Diamond's Bicolor is almost the same weight at Holly's Chocolate Tortie. He is huge. You should see the size of his paws. Hopefully they all will blend together well. On May 4th, Diamond went down to The Sound Cat. She was on Day 63 of her pregnancy. I wanted a pregnancy x-ray to ensure that the babies were not too large to come out. Well I am glad I did. She had one baby whose head was 33 and her girth was 31. The baby weighted 144 grams. So Diamond had a C-Section. She had two beautiful extreme faced kittens. 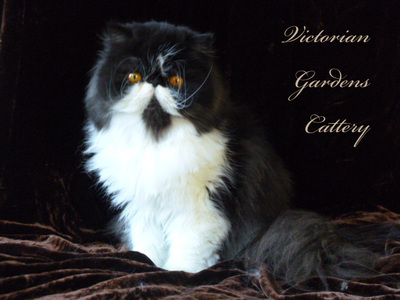 She had a Black and White Bi-Color Male Persian and a Black Female Persian. Dr. Williams spun Diamond's blood to get serum to be put in the Colostrum powder I had brought with me. Wow. How amazing is that? These babies will have ampted up virus protection from their mother's blood serum. Awesome. The male is already nursing. I have been hand feeding both the Colostrum/Serum to get them off to a good start. I have to babysit Diamond since she has never been the best mom. I have already caught her once sitting in her litter box away from the babies. The male Persian is solid and so heavy built.